Introduction: Our continuing investigation into all that Megabass has to offer has taken us through highs with products like the Vision 110 jerkbait and the F4-610XDti Elseil, and lows like the VibrationX and F4ST-69RSDti Orochi Evoluzion. We've looked into the totally impractical yet desireable products like the Asylum, and products we simply could not do without, like the DeepX 200T crankbait. What more is there to experience? Well, how about a $20 spinnerbait? Introducing the Megabass V-3 Bullet Shad and Bullet Shad Mini. 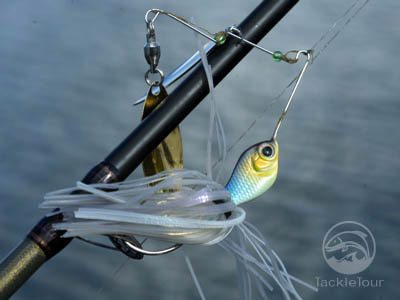 Impressions: If there is a special place in my tackle arsenal for one bait, that product would be the spinnerbait. It's versatility in bass fishing is unrivaled and its fish catching ability well proven. 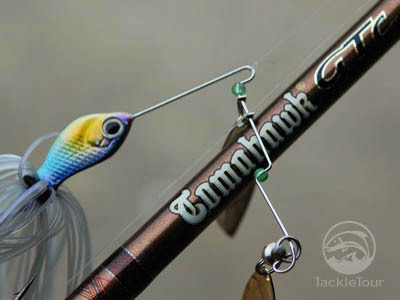 But while I can somewhat understand and appreciate some of the higher priced cranks, jerkbaits and other hardbaits Megabass has to offer, I have a difficult time understanding the need and justification behind a spinnerbait priced at twenty whole dollars. 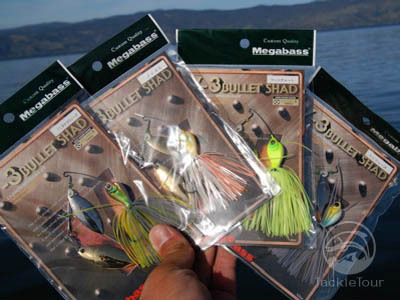 Certainly Megabass's packaging of these baits is impressive, but really... twenty dollars? The Field Tests: So of course, like any good tackle tester would, the best way to uncover why, is to purchase a few to sample and see what the fuss is all about. Then off to the water we took. Through the course of the last several months, I fished the V-3 Bullet Shad on several rods the most frequent of which were my F4-610XDti Elseil and my F3 1/2-65GTC Hien Type-S. 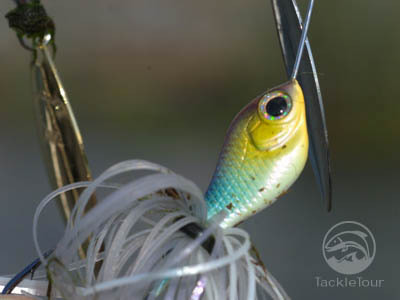 Casting: The Megabass V-3 Bullet Shad spinnerbaits features a compact design that is easy to cast and place with accuracy. 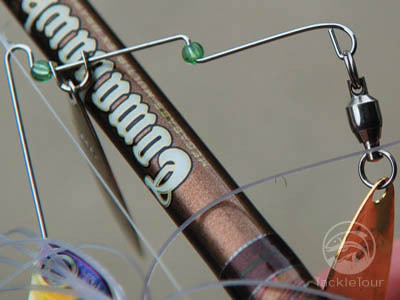 The blades do well to avoid one another on the cast and I didn't run into any issues with the bait fouling on the cast. 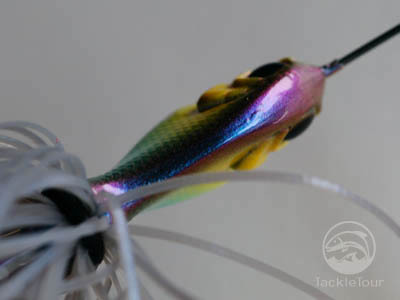 The Bullet Shad Mini features a bend in the blade arm to keep the blades separated while the standard Bullet Shad features a collection of plastic tubes and balls to achieve the same outcome. Both configurations seem to work fine. ... multi-bend arm, and large bearing swivel. 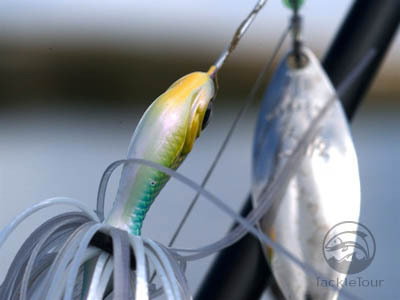 The Fall: A trademark of most any, quality spinnerbait, is the ease by which it flutters down the water column once it hits he water. I'm pleased to report the V-3 Bullet Shad flutters down quite effectively as I could see the blades flashing and swinging and twirling on the baits journey to the bottom. ...with a very narrow top. This design is supposed to make the bait wobble from side to side in the water as you retrieve it. Next Section: Is this bait really worth 20 dollars?